Green Gold Animation, makers of India’s one of the most iconic and popular animation character Chhota Bheem, has revealed the trailer and poster for their upcoming animated feature, Chhota Bheem: Kung Fu Dhamaka. Releasing on 10 May 2019, Kung Fu Dhamaka will find an upgraded, powerful and stylish 3D version of Bheem with killer Kung Fu moves and a great amount of fun as its driving force. 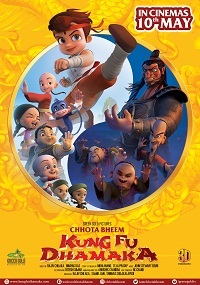 Chhota Bheem: Kung Fu Dhamaka is set in China where Bheem and his friends set out on an adventure in the Land of the Dragon to participate in the biggest Kung Fu competition of the world. However, the capturing of the princess by China’s arch nemesis Zuhu hinders the competition and Bheem is called upon to rescue the princess. The film is also directed by Rajiv Chilaka along with Binayak Das. Produced by Green Gold, Chhota Bheem: Kung Fu Dhamaka will be distributed by Yash Raj Films to give the film the widest ever release for any animation title in cinemas across India.